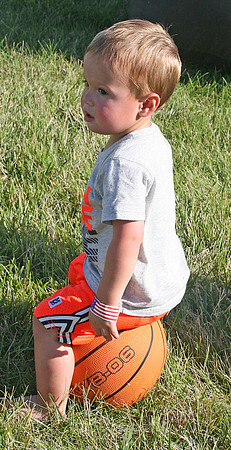 FANTASTIC FOURTH: Hunter Cope, son of Marissa and Tim Cope, takes a break from shooting hoops to listen to the music at the Whitestown Fourth of July Celebration on Friday. The event was postponed due to severe weather on July 3. The evening featured food, music, a kids' play area and fireworks at dusk. Though Marissa Cope said her son usually prefers soccer, he seemed to be having a great time playing with the inflatable hoop set at the event. "He's having a blast," she said. "It took him a little while to get used to the inflatable stuff, but now he's a maniac out here."